Hunters Hill is an attractive, historic peninsula that lies between the Parramatta and Lane Cove rivers on the north shore of Sydney Harbour. The suburb, a precursor to the Garden City movement, was subdivided in the 19thcentury with sandstone mansions and Victorian timber cottages sitting side by side, with large gardens and private parks containing centuries old trees. It was natural to choose stone and timber to build a new house on the edge of one of these private parks. Sydney sandstone has a slightly yellow hue that darkens and becomes more attractive over time. 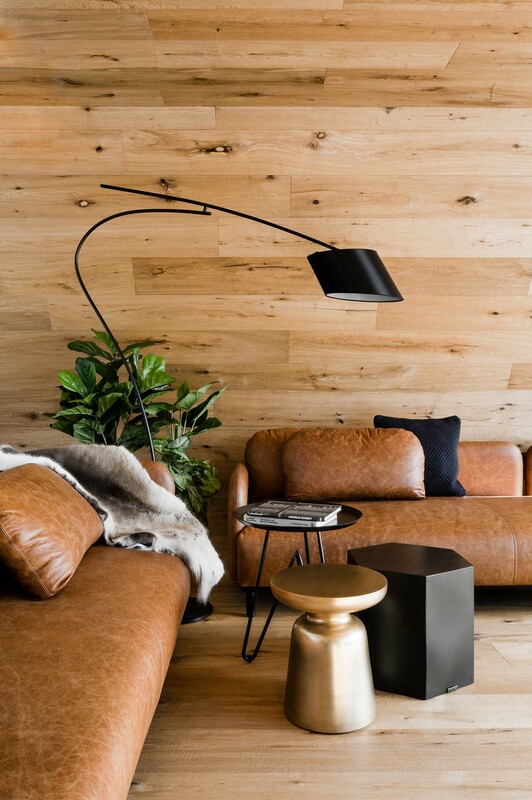 The timeless materials provide a warm colour palette in an otherwise contemporary construction. Behind the sandstone walls, huge, double glassed (Skyframe) windows with minimal framing are pocketed out of sight. Post tensioned concrete slabs have been cantilevered with minimal steel post support to cover the main garden terrace. Behind vertical timber shutters, curved glass windows span from floor to ceiling. 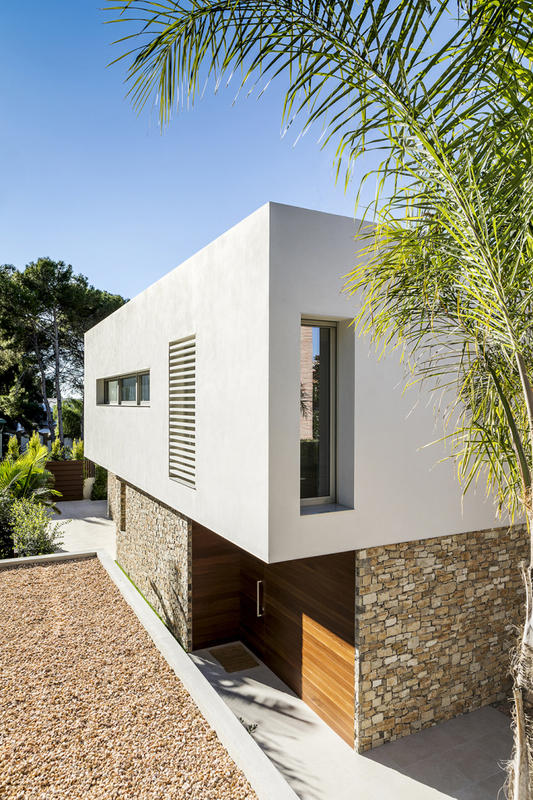 Designed for an uncluttered and relaxed family life the house layout is very simple and quite cartesian in plan except for one sinuous wall overhanging the driveway. 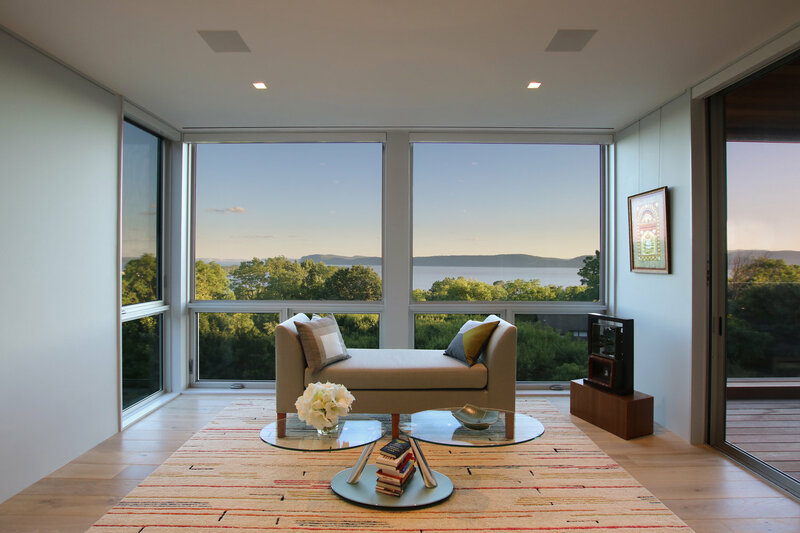 Every room opens to a terrace or the garden through large glass doors that slide on ball bearings; one can step outside without noticing the thresholds. Additionally, one can move fluidly from the entry to the open plan living space while hardly noticing the floor to ceiling timber door that, when open, is entirely hidden in the wall but when closed completely separates the open plan area from the rest of the house. All this modern machinery for easy living could end up being sterile and boring without a dark side: take the stairs to the basement and you will find a subterranean level housing a car collection, a home theatre, workshop, and wine cellar. Project Architect, Jane McNeill managed to pull out of the barrel a beautiful cellar and perfectly detailed drawings that required no site visits and no questions from the Builder to execute. Sydney sandstone walls, steel and timber adjustable screens and concrete slabs are the spare and restrained and dominant materials of the entry frontage. 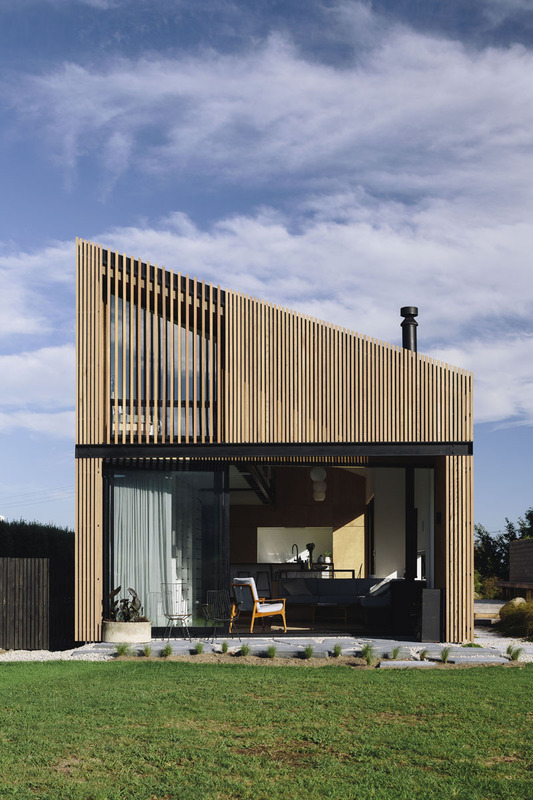 Close to the neighbours and to the access road it needed to offer privacy yet at the same time allow the northern sun to filter into the house. A game of open-and-close may be played with the resulting shutter solution. The entry steps are laid on a gentle incline, with a ramp to one side to provide ease of access for children’s prams and for moving the garbage bins. To the eastern elevation privacy is not required; on the contrary the situation of the house, on a Hunters Hill riverfront plot with its view of the yacht moorings on the Lane Cove River is the perfect reason to open it up to its fullest so as to embrace the invigorating and idyllic setting. 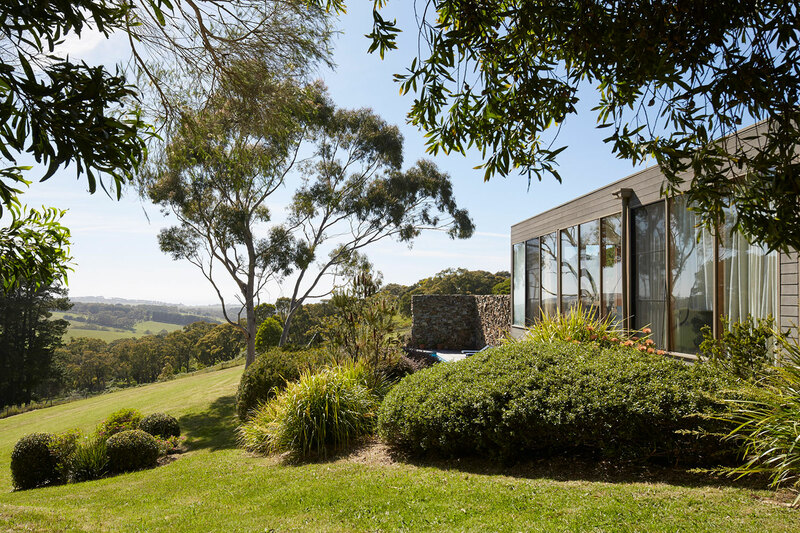 Floor to ceiling windows can be pushed back to disappear completely behind the sandstone chimney wall and one may step out onto the veranda completely unobstructed. 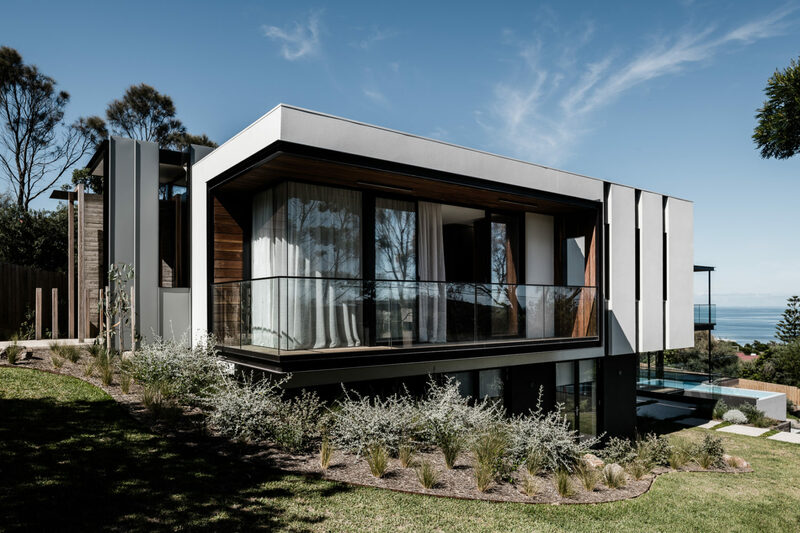 The simple terraces and rooflines of the house contrast with a muddle of “must-have” accessories – spa, pool shower, pizza oven and barbeque – required for outdoor living. 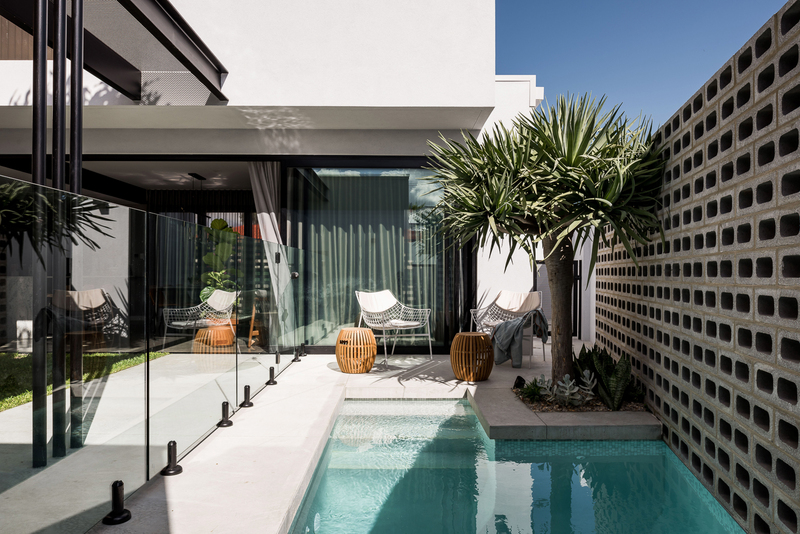 The swimming pool itself features a flush wet edge to facilitate ease of entry into and exit from the water and a concealed pool cover, which is remote operated and rolls out of a slot at one end of the pool.